Let me start off by stating that mindfulness and mindfulness meditation deserve our attention. There is a great deal of empirical evidence that shows that mindfulness and mindfulness meditation can be beneficial in multiple ways (read this and this for more information). Having said that I'd now like to express two concerns. A first type of concern is about our lack of knowledge. The studies I mentioned in my previous posts suggest that it works. But what precisely is 'it'? Some of the most impressive sounding studies have investigated the effects of Mindfulness Based Stress Reduction (MBSR) programs. This type of program is an eight-week group training program that entails weekly group meetings, homework, and instruction in three formal techniques: mindfulness meditation, body scanning and simple yoga postures. This program consists of multiple components and the research in question says nothing about to which components the beneficial effects can be attributed (correct me if I'm wrong). We have clear indications that something works but we don't know what it is. Is the group-setting essential? Is the eight week length of the program necessary? Which of the three formal techniques contributed to what to extent to the beneficial effects? How important was the role of the facilitators? Was the fact that they were certified a prerequisite? Or were there implicit commercial reasons for their certification? Was the number of sessions important? To what extent did other contextual factors contribute to the effects which were found? 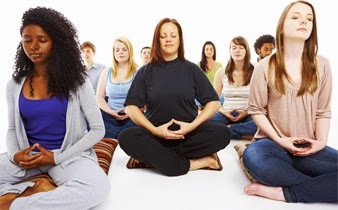 A wide range of mindfulness meditation exercises are offered by many instructors. Some focus on breathing, some on relaxation, some on mindful awareness of thoughts, some on emotions, some on hear sounds and rhythms, some on varied forms of bodily sensations, some on mantra's, some on chakra's, etc. Are all these equivalent? As far as I know, this is not known (correct me if I'm wrong). A second type of concern is about the popularity of mindfulness. Now that serious scientific studies into mindfulness meditation have demonstrated benefits, it has become more and more popular. It may become a big fad. Some may say that it already is. When something -anything- becomes a fad it is wise to remain skeptic. When the common opinion becomes that mindfulness is 'great' we may tend to stop asking questions and feel obliged to go along with what 'experts' say: if they say you need and eight-week program, then you do need an eight week program. Or maybe not. Maybe a much simpler, briefer and more self-directed approach might also work. There is also a risk that we start to expect too much of mindfulness meditation. I mean this in two ways. The first way is that we may start to view it as a cure for everything. But, there are many human problems, I believe, for which mindfulness (meditation) is not the cure. The second way is that we may get an overblown expectation of how wonderful everything will become once we all will start meditation. I read that Jon Kabat-Zinn, the founder of Mindfulness-based Stress Reduction (MBSR) has said that the mindfulness movement “has the potential to ignite a universal or global renaissance… that would put even the European and Italian Renaissance into the shade", and that it “may actually be the only promise the species and the planet have for making it through the next couple hundred years.” (Source). The only promise? Isn't that a bit overblown? Kabat-Zinn's remark may say more about how restricted his focus was when he said this than about anything else. Of course, this post is not intended to denigrate mindfulness or mindfulness meditation in any way. It does seem to be quite valuable. But we need to learn much more about it and we need to remain skeptic.